The average American adult spends about four and a half hours a day watching TV -- and that's more than enough to take a toll on their health and longevity. A new study, published today in Journal of the American Heart Association, found that adults who watch TV three hours or more a day may be twice as likely to die prematurely than those who watch an hour or less. 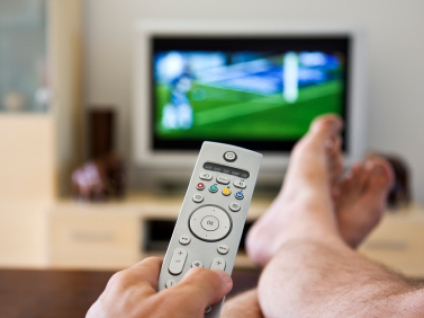 Previous research has shown that too much time spent sitting in general is detrimental to people's health, but this latest research found that watching TV specifically can have an even more negative effect than other types of sedentary activity. The study authors cited previous research suggesting that about half of U.S. adults are leading sedentary lifestyles. "Television viewing is a major sedentary behavior and there is an increasing trend toward all types of sedentary behaviors," study author Miguel Martinez-Gonzalez, a professor and chair of the Department of Public Health at the University of Navarra in Pamplona, Spain, said in a statement. In the study, researchers examined 13,284 healthy, college-educated Spanish adults (average age 37) and followed them for about eight years. During this time period, the investigators reported 97 deaths, with 19 deaths from cardiovascular causes, 46 from cancer and 32 from other causes. "It draws attention to the hazards of sedentary behavior," Dr. Keith Ayoob, an associate professor of clinical pediatrics at the Albert Einstein College of Medicine in New York, told CBS News. Interestingly, the study did not find a link between the time that people spent in other sedentary activities, such as using a computer or driving, and any increased risk of premature death. One of the reasons for the negative impact of too much time watching TV may be that this particular activity encourages people to eat too much at the same time, he speculated, which may affect their overall health. "It (watching TV) is very compatible with mindless eating and mindless snacking," Ayoob said. "It may be that TV viewing is a marker of a particular lifestyle." However, the study did not determine the mechanism behind the relationship between the time spent watching TV and people's risk of premature death, he noted. The American Academy of Pediatrics recommends a maximum of two hours of screen time a day for kids, and it might be good idea for adults to follow this recommendation too, he said. Martinez-Gonzalez agreed. "Our findings suggest adults may consider increasing their physical activity, avoid long sedentary periods, and reduce television watching to no longer than one to two hours each day." But as the evidence accumulates that a sedentary lifestyle is bad for our health, what advice do the experts have to offer? Ayoob recommends that people should try to get out of the house more, to cut down on opportunities for "mindless eating." "Be more active, but also be less sedentary," he said, encouraging people take the stairs instead of the elevator whenever they can, for example. He also stressed the importance of simple, everyday activities that force people to get up and move. "There may be a benefit to doing mundane chores," such as cleaning or doing laundry, he said. Instead of paying someone to do that for you, "Do stuff yourself," he added.